Get the right shoes. Nursing home patients need good shoes that will keep them from slipping and falling. Shoes should have non-skid or rubber soled lace-up shoes. Make sure the soles are not too thick and that the shoes fit properly. Slippers are not a good idea for walking as they usually are loose fitting and tend not to have the proper traction. Stay well rested. Getting plenty of sleep is important to cognitive and physical function. Patients should make sure they get a good nights rest and take a nap if needed. They also need to be careful of standing up too quickly when they do get up. Blood pressure can be affected when they stand up quickly, making them feel dizzy. Watch their step. 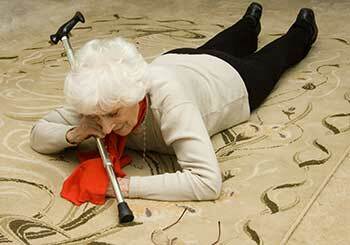 Nursing home patients can prevent falls by keeping an eye out for hazardous walking areas. They should avoid crowded areas that are hard to navigate. They also need to be on the look out for wet or slippery looking floors. These can be hard to keep their footing on, even with the right shoes. Any precaution that residents in nursing homes and their families can take to prevent falls should be adhered to. Falls are the number one cause of injury fatalities for elderly people and also can lead to fractures, traumatic brain injuries and many other problems. The best solution is to do everything possible to make sure do not happen in the first place.